Romitaman Original Comic Book Art :: Private Collection :: Daredevil Poster Art Presentation Pinup by artist John Romita Sr. Check out this neat Daredevil pinup drawn entirely by the great JOHN ROMITA on art board way back in the 1970's! 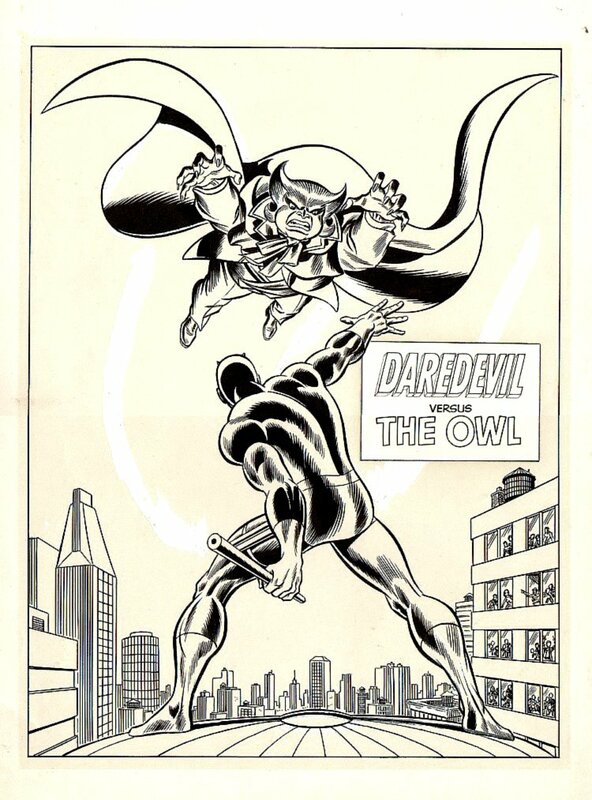 This image was used as a presentation piece to try to get Daredevil his own cartoon, and this pinup features DD battling his classic foe: THE OWL! This art is large sized and would be about the same size as a silver age large art cover minus the logo area, as it has an actual art image area measuring 11.75 inches wide by 15.75 inches tall on a 14 by 19.25 inch much larger art board. So don't miss out on this RARE BEAUTY if you can help it!